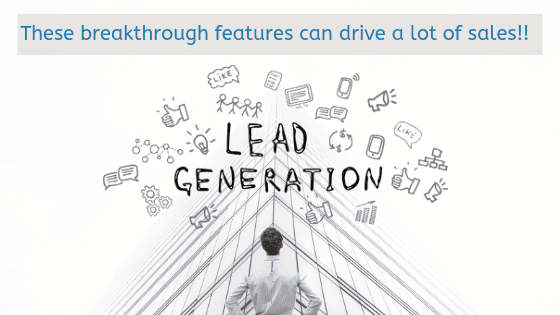 Lead generation considers itself as an effective way for their business development, and every organization is on their toes in chasing for convertible leads and collecting them. This piece of content is worth to read if you want to drive leads crazy!! Top Tip: 1 Extract your visitor’s details. And every unique and frequent visit of the customer pays off because, somewhere and somehow your website is visible and unique, so make use of these visitors wisely. Top Tip: 2 Email Marketing Works! Refined automation on effective email marketing providing a consistent reach towards the audience and letting them know all the details regarding updates, new features, offers and discounts, and services serves great in turning your audience to a client. Top Tip: 3 Nurture your lead campaigns. Create a lead generation campaign for your business initially and further can make improvisations and nurture your leads from the beginning. Your top priorities should be on quality with a creative and a converting content and images. Conveying your service at it’s best in a crisp. Top Tip: 4 Scoring and Sharing Socially will help your Brand. Online presence is obvious and considered high-value in case of fetching a lead online. The chances of scoring via social media is very high and this lead generation task of a gold hunt is apparent when your brand emerges and widely reachable among the audience. When a convertible lead serves you through social media, then this platform can be a valuable strategy for high-quality leads. Hence, maintaining a high profile social forums with an engaging interface serves good throughout the process of lead generation. Top Tip: 5 Social Proofing. When this whole world online are judged based on the reviews. Visible presentation of the customer reviews, testimonials to them will build trust among the audience. Top Tip: 6 Value your presentation skills. Communication in the lead generation is the on-top important practice for client conversion and serving them with the most comfortable means of communication is the only possible and the most powerful way for higher conversion rates. Making them more comfortable towards communication on a phone call, emailing or texting them according to their convenience and can influence your audience to a greater level. Hence effective conversation builds stronger communication. Top Tip: 7 Meet and greet. Organizing a meeting with the client and preplanning your pitch, works great in case of client conversion. Once when a meeting arranged is successful, then there are maximum chances of converting that audience into your client. Henceforth plan for a smooth and a professional discussion. The most potential part of acquiring and maintaining a client/consumer is simply following up with the content regularly. When you leave a wide gap in between the lead capturing and generating, then the lead will have a major chance of not getting converted. Hence, always follow up regarding the status with the clients. Top Tip: 9 Revisions and refined communications. The more the time spent on pitching the right words, the more increase in the conversion rate. With repeated corrections and updations, having a more enhanced and perfect tagline would faster the means of the conversion rate for reliable leads. Hence the above-specified practical tips serve great in converting your audience into your clients with 80% success probabilities. Hard converting your audience into your clients?